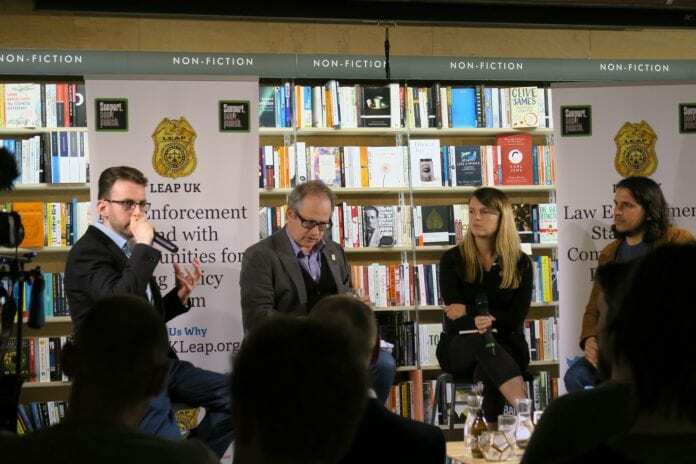 Last night we attended a podcast called ‘Stop and Search‘ in association with LEAP UK, a new live event where they record a monthly show discussing current drugs laws. Robin Ince – ‘Broadcaster’, podcaster, science buff, comedian and all around niche reference maker. Dr Suzi Gage – Drugs & mental health researcher at MRC IEU Bristol University, Guardian science blogger. Simon Oxenham – Journalist and blogger, better known as the fantastic Neurobonkers. Neil Woods the Chairman of LEAP UK and former undercover drugs detective was also at the event and gave a good introduction talk before the podcast kicked off. Neil has had a Vice feature written about him (click his name for the link) and is also currently working with a production studio to make a televised programme about his time undercover. He shared some stories and gave excellent insight into the failings of prohibition from the perspective of somebody who has seen both sides of the war on drugs. The podcast itself was a refreshing conversation about drugs, their potential harms and the much bigger harm of drug prohibition – it was a far throw from the usual tabloid junk generated around drugs with the guests giving scientific evidence around statements and discrediting some journalistic approaches to things like drug deaths and adulteration. Cannabis prohibition was of course discussed, and the guests talked about the harms of a lack of education around cannabis – quoting the classic example of how children are told all drugs are bad in school as opposed to some drugs are more harmful than others. The new podcast is hosted by Jason Reed – regular ISMOKE readers will remember Jason as HomeGrownOutlaw, a regular ISMOKE writer back when we set up the magazine in 2011. It is set to explore the dark recesses of our drug laws. With celebrity guests, journalists, politicians, academics and policy experts, a monthly panel will apprehend drug policy, whilst being stopped and frisked by the pertinent questions of the day. The next edition will feature Liberal Democrat MP Norman Lamb, who recently introduced his private member’s cannabis bill, so it should be an interesting evening. If you are in London and can get down to the Waterstones in Tottenham Court road for the next event it would be great to see you down there. Event details coming soon. Will will update this article when the link to stream the podcast comes online. Details for the next event also coming soon.